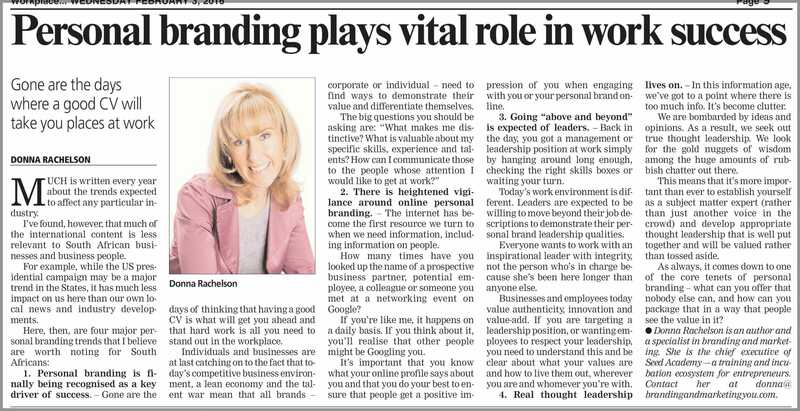 There is heightened vigilance around online personal branding. The internet has become the first resource we turn to when we need information, and that includes information on people. How many times have you looked up the name of a prospective business partner, potential employee, a colleague or someone you met at a networking event on Google? If you’re like me, it happens on a daily basis. If you think about it, you’ll realise that other people might be Googling you. It’s important that you know what your online profile says about you and that you do your best to ensure that people get a positive impression of you when engaging with you or your personal brand online. Going “above and beyond” is expected of leaders. Back in the day, you got a management or leadership position at work simply by hanging around long enough, checking the right skills boxes or waiting your turn. Today’s work environment is different – leaders are expected to be willing to move beyond their job descriptions to demonstrate their personal brand leadership qualities. Everyone wants to work with an inspirational leader with integrity, not the person who’s in charge because she’s been here longer than anyone else. Businesses and employees today value authenticity, innovation and value-add. If you are targeting a leadership position, or wanting employees to respect your leadership, you need to understand this and be clear about what your values are and how to live them out, wherever you are and whomever you’re with. (Real) thought leadership lives on. In this information age, we’ve got to a point where there is too much info. It’s become clutter. We are bombarded by ideas and opinions. As a result, we seek out true thought leadership. We look for the gold nuggets of wisdom among the huge amounts of rubbish chatter out there. This means that it’s more important than ever to establish yourself as a subject matter expert (rather than just another voice in the crowd) and develop appropriate thought leadership that is well put together and will be valued rather than tossed aside. As always, it comes down to one of the core tenets of personal branding – what can you offer that nobody else can, and how can you package that in a way that people see the value in it? 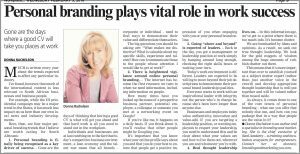 This article originally appeared in The Star, Workplace on 3 February 2016.